when hanging from a mast, particularly for indoor use, the folds hide the precise point at which the two stripes meet. 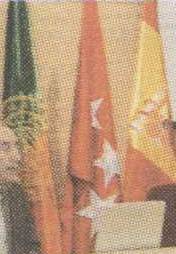 Actually I started researching this flag because I couldn't understand what was a Portuguese flag doing at a CCM event bearing no relationship at all with Portugal. "Art. 158. La bandera de la Cámara estará constituida por dos franjas verticales de igual dimensión, siendo la de la izquierda de color verde (símbolo heráldico del comercio) y la de la derecha de color morado (símbolo heráldico de la industria). "En el centro de ambas franjas [*] irá sobre bordado o sobreimpreso, en color amarillo oro, el emblema de la Cámara. "Art. 159. El emblema de la Cámara estará constituido por una rueda dentada, símbolo de la industria, dentro de la cual se insertará un caduceo, símbolo del comercio, y se sobre insertará el escudo que simboliza tradicionalmente a los Cinco Gremios mercantiles de Madrid, con las cadenas; y todo ello circundado, a su vez, en forma circular, con la leyenda "Cámara Oficial de Comercio e Industria de Madrid." (...)"
"Art. 158. The Chamber's flag shall be made up of two vertical stripes of the same width, being the one on the left green (heraldic symbol of commerce) and the one on the right purple (heraldic symbol of industry). "On the centre of both stripes [*] shall be embroidered or printed the Chamber's emblem in gold yellow. "Art. 159. The Chamber's emblem shall be made up of a cogwheel, symbol of industry, within which shall be included a caduceus, symbol of commerce, and also included shall be the arms which traditionally symbolises the five merchant Guilds of Madrid, with the chains; the whole circumscribed with the circular scroll "Cámara Oficial de Comercio e Industria de Madrid."(...)" [*] Should be "en el centro de la bandera" i.e. "on the centre of the flag." Even though the fly is clearly defined as purple, the flag appears to be always manufactured in red, according to many pictures of actual flags. Not even dark red, which might be confused with purple, but the same bright red as in the Madrid Community flag which frequently appears beside it. The emblem is always used in a very stylised design, and its central part can be seen on the Chamber's website. "Cámara Madrid," monthly journal of the Madrid Chamber of Commerce, years 2002-2003. E-mail from Mr. Javier Mancebo to the author, PR Dept., Madrid Chamber of Commerce, 12th January 2004. I seem to have spotted a flag that I cannot identify. It appeared in a photo published in the Portuguese newspaper Público on 10 December 2004, illustrating an article about problems in a governmental plan to restructure the energy sector in the country. 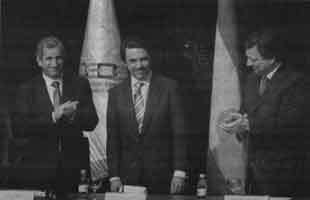 The three suits in the photo are Durão Barroso, former Portuguese PM and current president of the European Comission, Carlos Tavares, former minister of energy (IIRC) of the Portuguese government and José Maria Aznar, former PM of Spain. It is, therefore, an archive photo, since none of these gentlemen still held their offices last December, and I believe it has something to do with MIBEL, an Iberian agreement in the energetic sector. Apart from the suits, the photo included two flags. One of them is easily identifiable as the flag of Spain, despite the photo being in black and white; the other one, however, is a UFE. The only thing I can say about it is that part of the writing in it seems to be "España" or "Español" (second word, first row). The rest is for grabs. The logo-type initials "CEOE" are those of the "Confederacion Española de Organizaciones Empresariales" (http://www.ceoe.es), a business organization. Its logo is recognizable, but I have no idea of flag´s design.